Dedicated Services specializes in relocating and servicing rubber tired gantry cranes, RTG's, straddle cranes, and travelifts. Contact us today to discuss your needs. Purchasing a machine for your lifting needs? Contact us to schedule a prepurchase inspection. 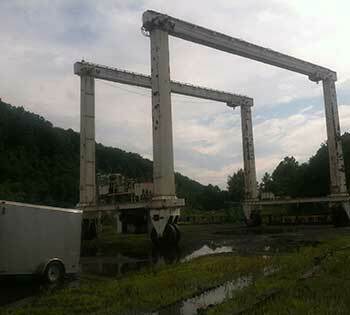 Dedicated Services has extensive experience moving your existing crane or brokerage cranes. We treat your machine like the valuable asset it is. Call us for a clean, well documented relocation. Check out our new page! We'll be adding a lot more! Protect your investment with proper preventative maintenace. From oil analysis to emergency pump replacement, we are here to manage maintenace needs and minimize downtimes.